Hey hey everyone, and welcome to the end of the week. Yippee. I'm so looking forward to the weekend because it's the middle of the school holiday's here, which means no kids sport first thing in the morning and nothing else planned! I can sleep in on both Saturday and Sunday. I'm so lucky that my husband is one of those people that automatically wakes up at the same time every day, so he is awake when the kids wake up. Me? I'm able to easily roll over and go back to sleep. Man I love sleep. My kids don't seem to understand how awesome sleep is, they always want to stay up late and don't understand what a sleep in is. I'm guessing sleep doesn't become awesome until your a teenager! 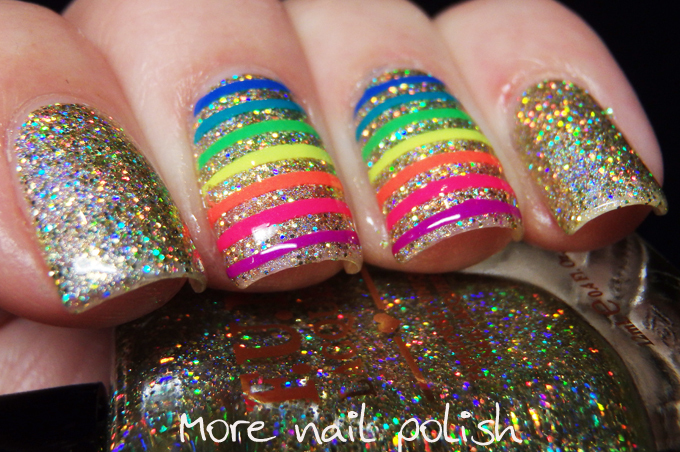 Anyway, I'm pretty excited to say that I finally got the Pipe Dream Polish A Night in Vegas Collection. I had a very quick fingered friend in the USA that managed to get them for me during the last restock. The ANIVC restocks rival the Enchanted restocks for craziness from what I've read, so I'm eternally grateful that she managed to get these for me. I had to restrain myself very hard not to do a watermarble first up. I mean everyone does a watermarble with ANIVC and I needed to something a little different. But of course I did have to use every colour. 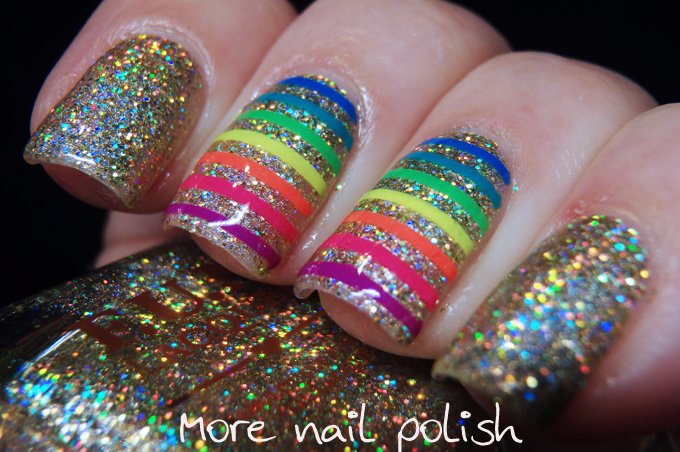 The way I ended up doing it was using some thin straight vinyls that I got from Xroma Polish and Vinyls. But don't worry, it is inevitable that I will do a marble with these very soon. My base polish is FUN Lacquer Mistletoe which is a very blingy lime gold holographic glitter bomb. I actually took photos of this as I went to do a photo tutorial. So here goes. 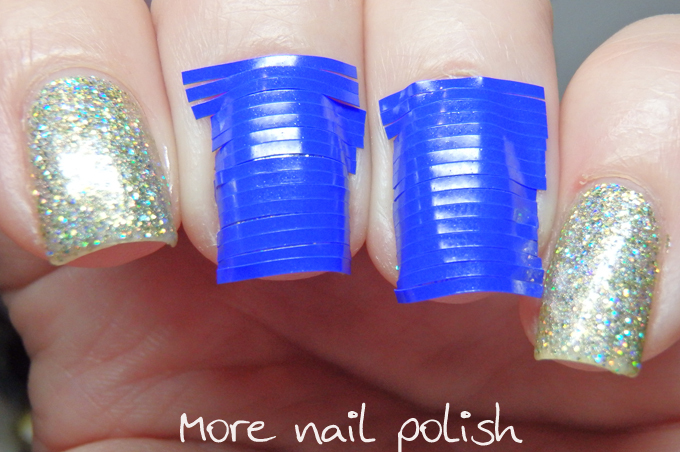 Apply a fully nail of thin straight vinyls. Peel off the middle vinyls to leave the gaps. 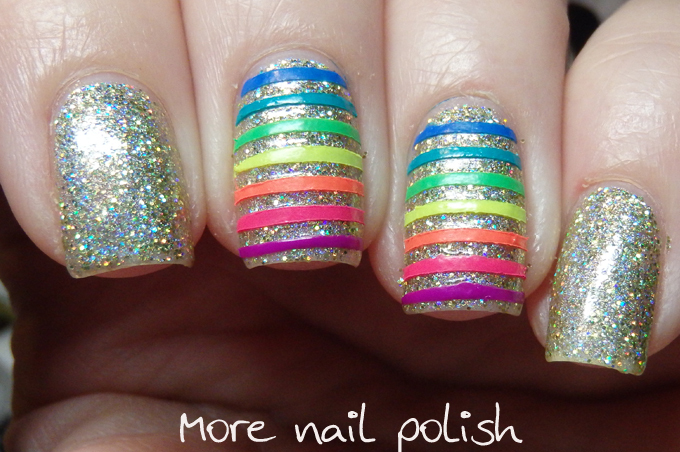 Use a thin brush to apply each colour between the vinyls. Once both sides of the vinyls is painted, remove the vinyl. Before top coat its going to look a little chunky. But after top coat is applied, the thick edges from the vinyls smooth out nicely. Nail vinyls provided for consideration, other polishes were bought by me. Second: OMG!!! You have changed my world! 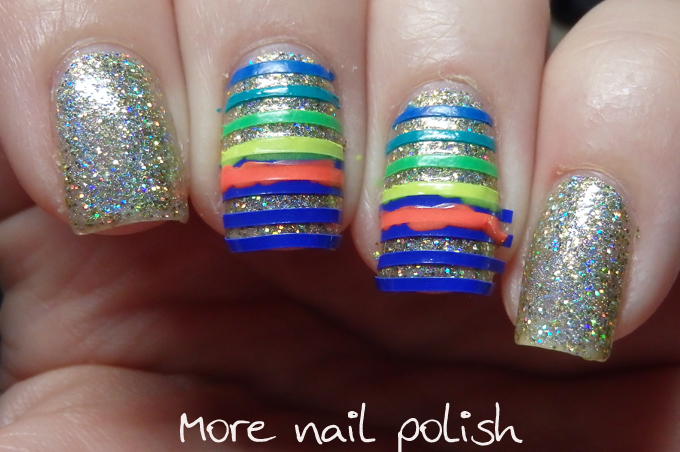 I've always admired tape manis with the colors all perfectly aligned and spaced apart. Thanks to your WONDERFUL tutorial, I now know the secret is to take a whole section of the nail vinyls straight off the backing and apply to the nail and then remove every other strip. AMAZING! Thank you! !